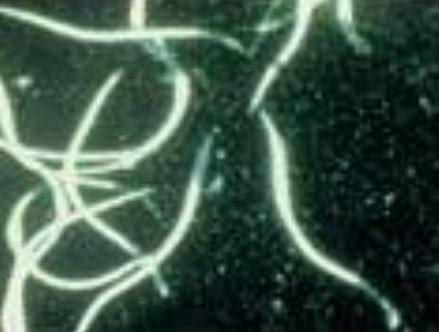 These Nematodes are totally safe biological control, superior to many chemicals. They only attack insects which have a larvae stage in the soil or which regularly crawl across the soil surface. They are harmless to humans, pets, birds, earthworms, honeybees, and most beneficial insects. Feeding characteristics: In the soil, these Nematodes actively search for insect hosts. Some even move to the surface of the soil to make contact with a passing insect. Once it enters the host's body, the tiny worm employs a symbiotic bacterium to digest its meal. The bacterium soon kills the insect within 48 hours. The insects that it regularly feeds on are: Borers, Cabbage Maggot, Root Weevils, Cutworm, Beetle grubs, Eastern Field Wireworm, Japanese Beetle, June Beetle, Army Cutworm, Northern Mole Cricket, Flies. Purchase Beneficial Nematodes at Organic Garden eStore.